Through a bottle division and sample accumulation left my remaining 5cl for about 3-4 months in the Anbruchflasche. The time seemed to do him good, because he comes now, compared to the initial cost to directly tearing the bottle, dangerous soggy therefore. the most positive is that he now has a very slight but noticeable trace of sulfur and I love that. In addition, the honey, peach, a lot of sweet malt, a lot of spice, light coffee notes, lemon in the background, autumn leaves. The nose may still convince with a pleasant sweetness and fruitiness. Then it becomes unbalanced in the mouth, bitter and brittle. One of the young, new whiskys that can not convince me. The addition of water makes it even more bitter. The brandy, previously stored in the barrels, was able to give nice sweet grape notes to the whisky, and the apparently quite old barrels bring a strong spiciness. This Deanston draws you from the first smell sensory into spicy depths, already when pouring it is present throughout the room. Strong forest honey, sweet pipe tobacco and roasted hazelnuts with dark caramelized Demerara sugar set off with full force. There are doubts about the year on the label - everything looks much more mature and older. Cooked dark grapes and mirabelle plums add a herbaceous sweetness on top. The Spanish barrels bring a very delicate dark wood note and set beautiful tart edgy accents. The alcohol is already quite dominant, especially at the beginning it stings disturbing the nose. He can be tamed with a little water - which, however, also increases the sweetness factor. Sweet thickened grape must and rum raisins are the first impressions that are perceived on the tongue and on the palate. Warm, strong and spicy, this all burns through the mouth. Again, a lot of sweet dark honey and cane sugar, in addition to the fruit sweetness, which is replaced more and more by sour Grapfruits and oranges. The increasing fruit acid and the strong tannins of the Spanish barrel have a powerful astringent effect and literally pull the tongue together. But thanks to the powerful sweetness does not animate the whole thing to a Schweppes face, but remains within tolerable limits. In addition beautiful oak notes and toasted aromas with dark bittersweet chocolate. And here, too, thanks to a peppery lovage note and strong spiciness, I have many associations with the 10-year-old PX. Here you still notice the still young age, the finish is rather medium long and less spectacular than on the palate. Furthermore, a beautiful spicy grape sweetness with tobacco notes and dark cane sugar. As he gets creamier, he quickly disappears with beautiful herbal notes. 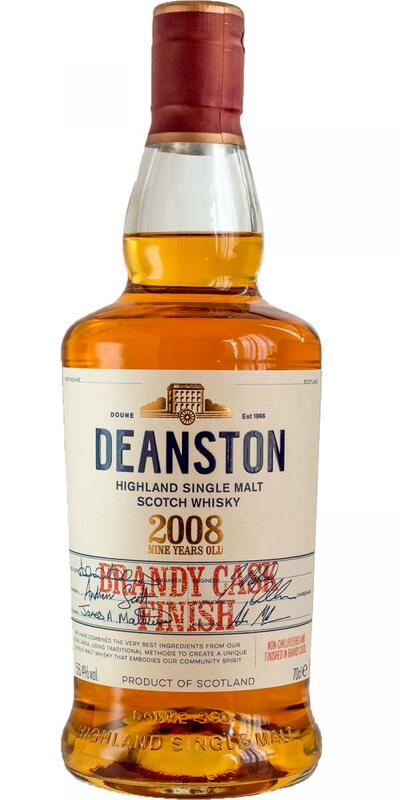 This Deanston starts with some fruits and hints of bourbon flavor in the nose. A little sweetness and honey comes by. The finish is short and sweet. Not very special. This one is definitely nothing for beginners. I would have preferred a little lower abv. Nice dram but nothing special.